The 2016 Footy Season has come around quickly and we are gearing up for another great season. Wherever your loyalty lies, put your footy smarts to the test and make sure you get online and join the Warrnambool Veterinary Football Tipping Competition today! We have a dedicated Warrnambool Veterinary Football Tipping Competition web page that you can register to use and enter your tips on a weekly basis. The bonus is you have until 10 minutes before the first game of the round starts to enter your tips. Visit www.footytipping.net.au/wvc to join, view the rules, and check out the leader board. The rules page also lists each rounds cut of date and time so you will never miss out! Take a look at some of the features such as Game History – a neat tool to help guide your team tipping. Need help registering? Take a look at the step-by-step instructions below. It’s a one off join process and then you have easy ongoing access to enter your tips, view the leader board and game history. The overall winner of the Warrnambool Veterinary Footy Tipping Competition receives a prize to the value of $250. Details will be confirmed with the winner at the end of the final round. The tipster who comes last will win a pet care pack to the value of $50 from Warrnambool Veterinary. Results will be updated weekly at www.footytipping.net.au/wvc with the top TEN and bottom TEN Tippers listed on the SUMMARY page and all Tippers scores shown on the TIPPERS page. We will also provide updates on our FaceBook page www.facebook.com/warrnamboolvet and in VetChat throughout the season. 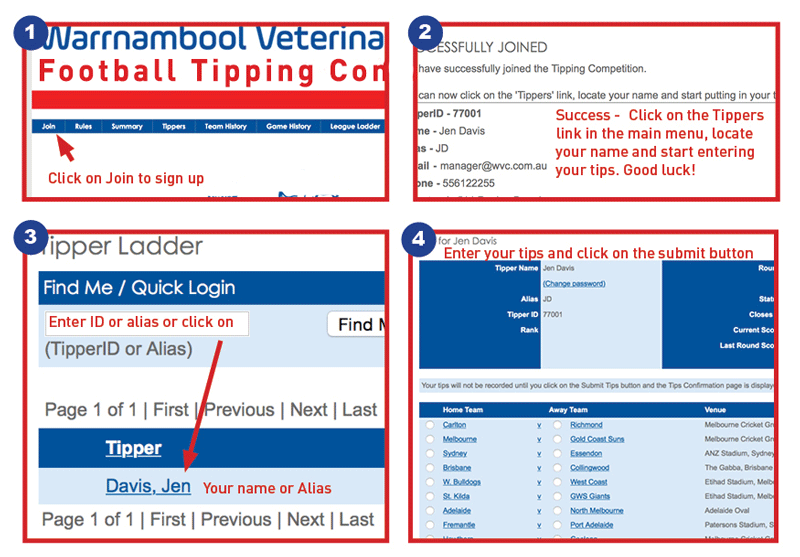 Go to www.footytipping.net.au/wvc and follow the steps outlined below for a simple one off registration. Happy tipping!